August has been a weird month of, you guessed it, mixed weather so there’s been a lot of swinging back and forth between summer styles and more Autumnal pieces. Soon it will be autumn in earnest and I’m looking forward to the launch of AW17 from my favourite brands, particularly with London Edge this weekend. Come back to the site on Monday for the full run down of the event and lots of pictures of upcoming releases! I love me some autumn and winter appropriate fabrics. Anything tweed, check, plaid, it all makes me really like this time of year when the dreary British weather can make it so much easier to dislike it. Finding swing dresses, rather than wiggles, in those fabrics can be harder, which is why I was excited when I came across the Tiger-Lilly dress by Voodoo Vixen. Featuring a flared swing skirt, half sleeves, matching fabric belt, pockets, and a wide collar and button combination detail, this dress is a great piece for cooler weather. November has been a strange month. The first 6 days of it made up the end of my American trip, the following week an adjustment period of jetlag and playing catch up which saw my motivation to dress prettily bottom out, and then a frantic two week period of busyness and prep as birthdays, blog work and the approaching festive season blended together to make a perfect storm of overwhelming ‘what next, what next?’ feels. Earlier this AW season Collectif released their Juliette dress, a gorgeous black pencil dress with faux fur trim on the neckline, cuffs and hemline. I swooned and coveted. It was so classic and chic. Warm too, I suspected. And of course it sold out quickly. So I was thrilled to see they were bringing out a matching skirt too. Sporting the same luxiourius faux fur hemline trim, the Andrea skirt has all the glamour of the Juliette dress with the additional versatility of a skirt. And guess what? I love it. I love black watch tartan. I’ve wanted a dress or full circle skirt in that colour of tartan for ages, but each time I find one it’s always out of stock. So imagine my delight when I found the Hell Bunny Aberdeen dress in just that print. 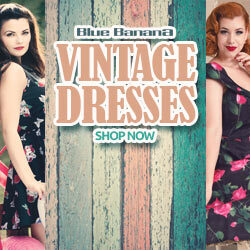 Collectif’s AW line has been bumper this year, with tons of gorgeous pieces and new prints. Of the latter, one of the most popular has to be the Woodland Bloom print, a gorgeous dark blue topped with blooming flowers in dusky pinks, muted greens and soft pops of periwinkle blue. It’s such a pretty and seasonal appropriate floral print that for a while I couldn’t decide which piece I wanted of those made in this print; the swing skirt, or dress, or pencil dress? Finally I decided on the swing dress, Maria. It gives me broody, autumnal feelings, in a pleasant fairytale kind of way, so I took to the woods to shoot it. November is the month of poppies because poppies symbolize the fallen of the First World War on Remembrance day, November 11th. In Britain especially it’s a somber, respectful time, with red poppies flashing at you from the lapels of workmates, family, friends and strangers almost everywhere you go not just during the week of November 11th, but for much of the month. For me, poppies hold a second association. On November 23rd 2003, my dad passed away following a 2 year battle against cancer. It was a difficult time and I barely remember anything much of the week and a half following his death. I remember coming home from the hospice and changing into the pair of clean spare pyjamas we had taken for him, not sure how long he would be in hospice–2 days–and I remember sitting at our lounge table a week later, trying to decide what to write on the little card presented to me that would be pinned to the flowers that would be lain on his casket. If you’ve never come across The Pretty Dress Company prepare to begin some intense coveting, because their name is apt and honest. When I saw this gingham Femme Fatale prom swing dress for the first time a few months back my want was immediate and intense. I’ve daydreamed about it ever since–that may sound sad, but I don’t care. I like pretty dresses and I cannot lie. Shan’t and won’t. And this, my little darlings, is definitely a pretty dress.